How can you find the nearest Moroccan restaurant? Follow your nose. The exquisite blends of spice and aroma won't lead you far! Moroccan food is bold and vibrant, just like its people and its cities. Chefs make frequent use of harissa (for a kick), fragrant rose and orange flower waters, and dishes topped with juicy jewels prized from pomegranate husks. It's easy to get overwhelmed when you notice the scent. You'll want it all, but where to start? Here are three dishes you shouldn't miss. 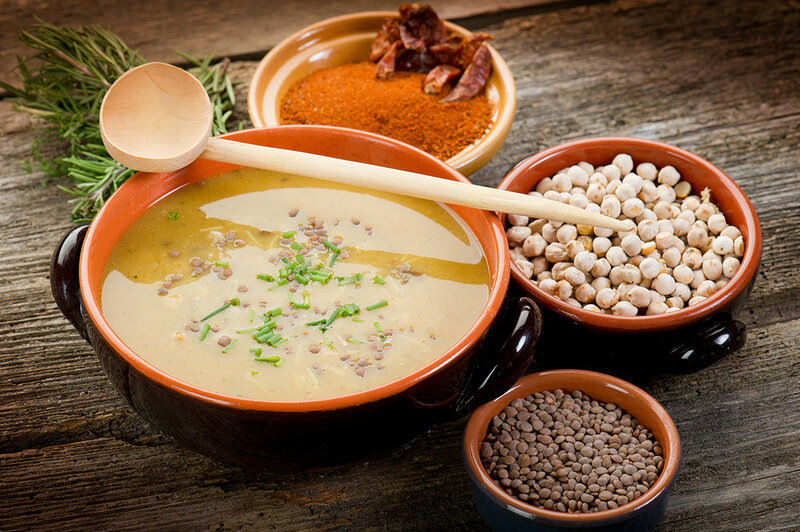 When visiting a Moroccan restaurant, you'd be wise to pick the harira soup to start. This gorgeous lemony broth is beloved by the people back home - it's delicious. We like it as either a light lunch or as an appetizer as part of an evening feast. A touch of chili, along with tasty meat stock and soft lentils, makes this the perfect way to start your Moroccan adventure. Tagine is a slow-cooked stew, cooked and served in a characteristic Moroccan pot with a 'hat.' That keeps the dish moist while leaving a hole in the top to allow steam to escape while the tagine cooks. Tagine will typically contain meat such as chicken or lamb, vegetables like aubergine, carrots, and potato, and served alongside rice or couscous. It's commonly spiced with Ras-el-Hanout, a blend of spices which translates as 'head of the shop.' It's traditionally a blend of the best spices available in the spice shop, though the recipe has become somewhat standardized. It often contains ground coriander seeds, cinnamon, cloves, nutmeg, and a healthy pinch of saffron. Moroccan chefs love this blend - it's not just for tagines! You haven't had a kabob until you've had Moroccan kefta kabob. 'Kefta' is the name of seasoned minced meat which is more or less a staple food in Morocco. It's packed with lots of different herbs and spices and made from either beef, lamb, or a mixture of the two types of meat. Diced onion and lemon juice are also often part of the package. That is all packed around metal or wooden skewers, and grilled over a high flame to add the scent of smoke and seal the meat. Pair it with a pot of sweet mint tea to share, if you want to experience the full traditional taste. Or as a lighter seafood alternative, shrimp kabob is equally delicious, though very different from our beloved kefta. And if you don't fancy either, there's always chicken! Are you ready to experience the real flavor of Morocco? Here at Kous Kous, we've dedicated ourselves to bringing the beautiful and striking food of Morocco to San Diego. Whether you choose one of the dishes above or not for your meal, we're sure you'll agree that this food is stunningly good! Our knowledgeable servers can help you decide what to pick, and also make drinks pairings a breeze. Book a table now - we look forward to meeting you!